Love Your Human Design » The voice of God? Why does Morgan Freeman seem so convincing as God? Actors and Actresses make good study for Human design as we get to see their expression through there body of work. While they are playing a part or a character, often there natural or defined energies shine through and help make them more believable in the role they are playing. You may want to watch this clip from Bruce Almighty where Morgan Freeman is playing God to see what I am talking about. Here are 8 reasons why his Human Design boosts his presence in the role of God. He has the energy in the mind of how abstract things fit together, channel 64-47. We would expect God to know how it all fits together and where we fit in. He can tell us what the experience will be and how it is going to worked out, the channel 36-35. He is king, gate 45, gate of rulership. He has charisma. The 5th line leading in his profile is magnetic and projecting. He has Universal Love, gate 25. He is talented, gate 16. He is sure of his identity. 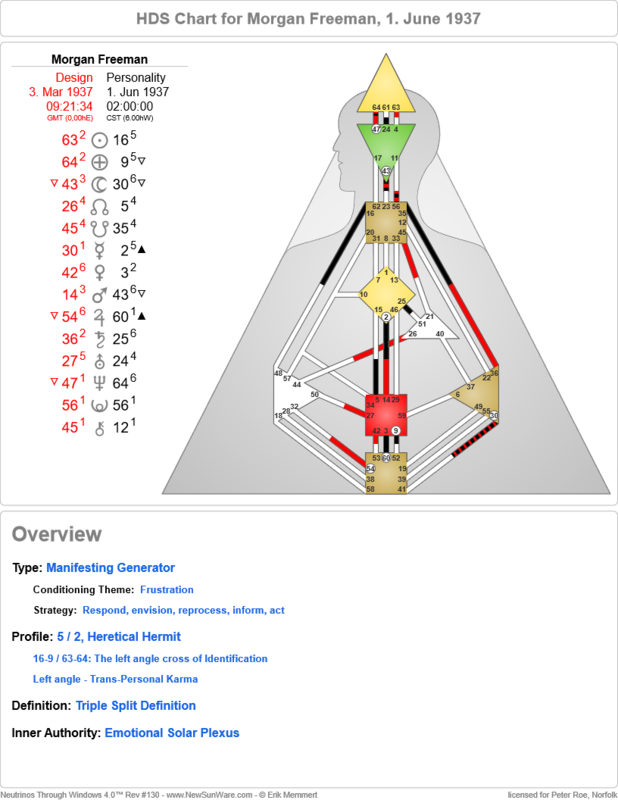 His identity is powered from the Root to the Sacral, channel 60-3, then the Sacral to the Identity center, 14-2. This is strong and convincing power. He brings in passion when he speaks, gate 30 Clinging Fire. In addition to playing God in the Bruce Almighty and Evan Almighty movies, Morgan Freeman has also been the host for a Nat Geo series about God. I think many of his characteristics I mentioned above, along with his Curiosity from gate 56, lend a hand in his success in that role regarding God as well.To see more on that search you tube for “Morgan Freeman Nat Geo the story of God”. Interestingly enough, I saw an interview that Morgan Freeman did with Jimmy Kimmel where he implies he doesn’t believe in anything after this life. If that is his true take, he has done a pretty convincing job otherwise.